I bought this stamped and used envelope a few weeks ago. Unlike my previous finds, the complete detail of the sender was provided. What seems to be unsearchable now is the identity of the real owner of this mail. In 1933, addresses in the Philippines are short and simple. The town or province of the recipient is enough for the mailman. There are probably less than a hundred people residing in the town of Lucena. At that time, everybody knows everybody. As for the sender, I'm quite surprised that I encountered a complete address. I searched for the address through Instant Street View and found this residential site. I was amazed by this web based application. You can see actual photos of a given address. 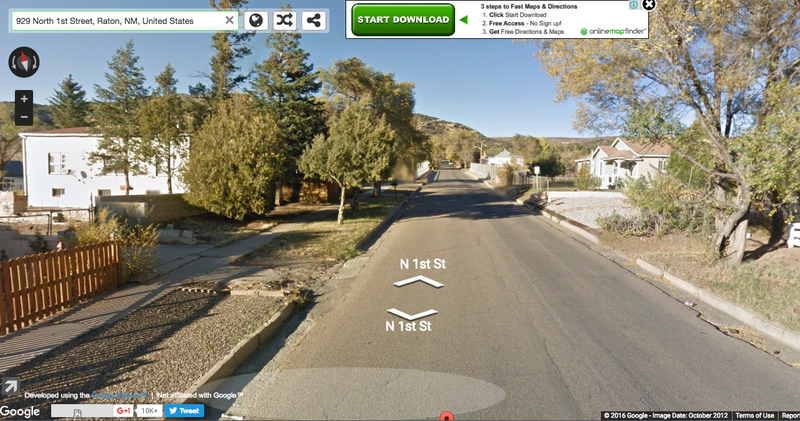 Instant Street View is like a better version of Google Maps. There are still photos of the streets that were captured around October 2012. This place in New Mexico is a residential site and feels very quiet and peaceful. Truth to be told, I initially doubted the authenticity of this envelope because the postmark is so neat. But when I checked the texture of the stamps, my doubts faded. The stamps have a different feel and texture. It felt like I touched a newly issued paper bill or a crisp set of linen papers. The stamps have this unique smooth micro layers. Since the details of the recipient are unclear, I'm focusing my research to the sender. If this website provides reliable Census figures, Leonard Fritz was born in 1916. He was around 17 years old when he sent the postcard. If he is still alive today, he is almost a century old. I wonder how is he related to the recipients stated in the envelope. As I further googled for information about Leonard Fritz, I ended with different leads. One obituary identified Leonard Fritz as a respected entrepreneur. Details from such article however do not coincide with previous year of birth mentioned. Also, this entrepreneur did not show traces of living in New Mexico. Another interesting lead is from the American Battle Monuments Commission. Leonard Frtiz was one of the American soldiers who became the casualty of World War II in the Philippines. He died in 1945 and his remains lie at the Manila American Cemetery. If he was really born on 1916, he was only 29 years old when he passed away. If he is the real sender in this envelope, I would like to believe that I have a memorabilia from one of the heroic and selfless American soldiers. I really like this project you're doing. I hope you get more leads to the senders or addressees.